West Windsor, N.J. – When Al Leister was growing up in a small Pennsylvania town, he spelled poorly, read slowly and often mispronounced words. But these classic symptoms of dyslexia went undiagnosed. Leister, who taught Health and Physical Education, as well as Mathematics, at MCCC from 1970 until his retirement in 2006, returned to campus during pre-class week to present a professional development workshop along with Director of Special Services Arlene Stinson. Leister went on to attend Lock Haven University, where he played soccer. “I was athletic and I had mechanical ability,” he said. Observing that many famous and accomplished people have dyslexia, he said that dyslexics often have considerable strengths in other areas. He noted that early on in college, he developed study habits that made the difference, including studying by writing material on notecards so that he was able to commit the material to memory. He also learned to hang out with good students. Prof. Emeritus Al Leister addresses MCCC faculty members during a pre-class week workshop. MCCC's Academic Special Services Director, Arlene Stinson, discusses Universal Design in Learning, an approach that accommodates different types of learners. 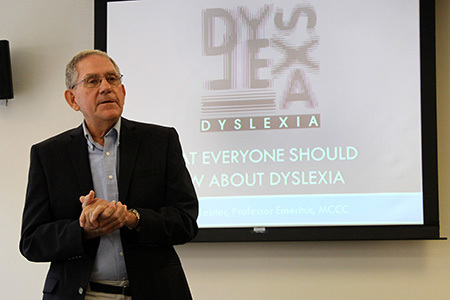 Since his retirement, Leister has become active with Decoding Dyslexia NJ. “Parents were upset by what was not happening in schools. There was no help for their children.” Leister said there are now 46 states with Decoding Dyslexia advocacy groups. Recently Gov. Christie signed three laws that mandate screening and support for children with dyslexia. 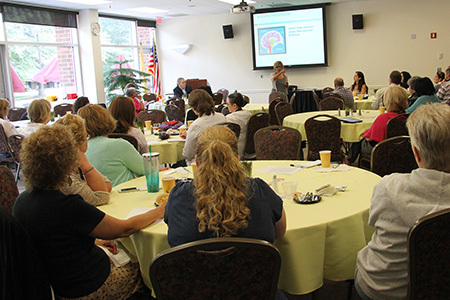 MCCC ’s Academic Special Services Director Arlene Stinson followed Leister’s presentation to discuss current accommodations available to students at Mercer, as well as a movement known as Universal Design in Learning. “We are moving away from simply giving extra time to the type of pedagogy that adjusts for different types of learning. Universal Design builds accessible curriculum from the ground up,” Stinson said. Stinson went on to explain the three principles of Universal Design in Learning: access – providing multiple means of representation; assessment – providing multiple means of action and expression; and engagement – providing multiple means of engagement. “It’s about reaching students in whatever way works best for them. As educators, we are learning all the time about the best methods for teaching diverse populations of learners. There is no one right way,” Stinson said. More information about dyslexia is available on the Yale Center for Dyslexia and Creativity website here. For more information about Universal Design in Learning, click here.